(1) The part of computer that indicates the file type is called extension. (2) A folder with in a folder is called a sub folder. 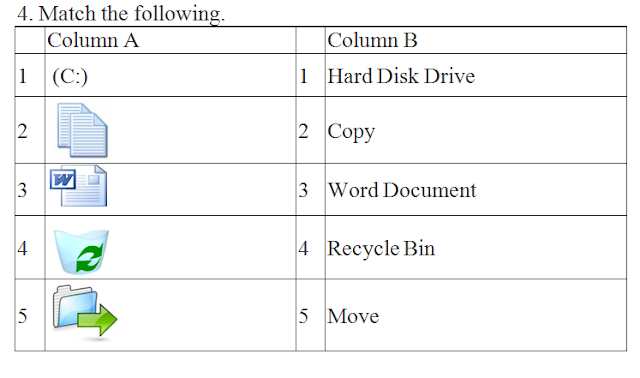 (3) The Restore command is used to return a deleted file from Recycle Bin to its original location. (4) The Empty Recycle Bin command deletes all the files and folders from the Recycle Bin. (5) Software’s used to protect against viruses and spywares while using the internet are called antivirus program. (1) You can see all the drives, folders and files in the My Computer window.True. (2) A folder may contain many files with the same name.False. (3) You can use the character , ? and *, in a file name.False. (4) The windows operating system shows the file extension along with the file name.False. (5) Arranging files and in folders and subfolders helps in better file organization.True. (6) My computers makes the management of files and folders very easy.True. (7) There is no advantage in purchasing an antivirus program.False. (1) In Windows OS, What are the limitations on the primary name of a file? Ans.The maximum length of the filename should be 255 characters and we cannot use /, \, |, <, >, ?, *, :, ;, ,. (2) State any four file types that you have used their extension. Ans.M/S word - .doc, M/S PowerPoint - .ppt, M/S Excel - .xls, Bitmap Image - .bmp. (3) Which command you will use to restore a deleted file? Ans,The restore command in the recycle bin used to restore a deleted file. (4) How will you delete all the files and folders from the Recycle Bin? Ans.We can delete all the files and folders from recycle bin using the command Empty Recycle Bin. (5)Where will a file, which is deleted from a folder, be stored? Ans.The file which is deleted from a folder is stored in Recycle Bin. (6) Name any four antivirus programs. 5. How will you perform the following task? (1) Delete s file in the My Computer window. Ans. Select the fie to be deleted and click delete button on the standard toolbar or select delete either from File Menu or from Right click menu. (2) Copy a file in the My Computer window. Ans. Select the file to be copied and click copy button on the standard toolbar or click copy from right click menu. (3)Create a folder in My Computer window. Ans.Select the file to be moved, click move button on standard toolbar and select the target folder then press move. 6. Answer the following questions in brief? 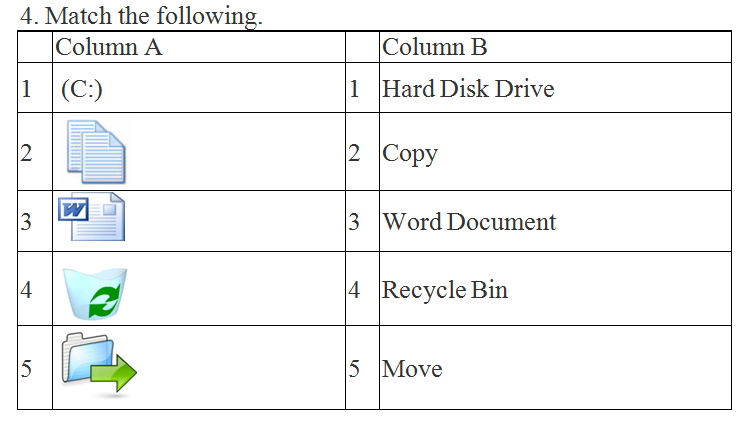 (1) What is the use of Recycle Bin? Ans. The deleted files store in Recycle Bin. If there is need then we can recall these files from recycle bin. And we can clear the Recycle Bin using Empty Recycle Bin command. (2)What are computer viruses? How can you protect your computer from viruses? Ans.Computer viruses are small program which can trouble the computer. It may change the data in a file, delete a file or send back information to somewhere. We can install antivirus program in our computer and scan our computers to find out and remove viruses.